Grass is a general term for the green vegetation that carpets lawns, crofts, roadsides and other parts of the landscape, and feeds a variety of herbivores. 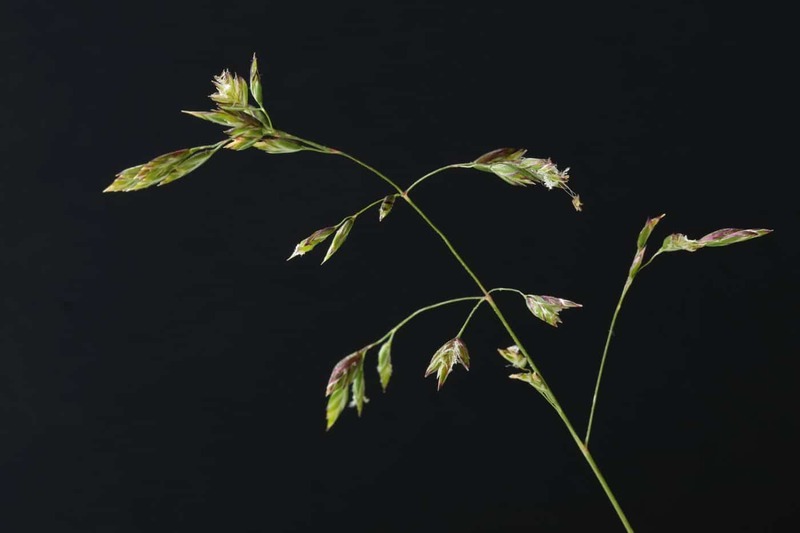 We tend to forget that grasses are a large and highly successful family of flowering plants, with undoubted beauty if examined closely, especially during the brief period when they are in flower. These close-ups, taken by David Haines at Culkein Drumbeg on 12th June, illustrate this point. The compact one is sweet vernal-grass Anthoxanthun odoratum, found throughout Assynt from the coast up into the hills. The more loosely-branched one is spreading meadow-grass Poa pratensis subspecies irrigata (formerly Poa humilis), frequent in light disturbed ground such as roadsides; it can grow on the tops of walls (and old strainer posts), and is also found in hill grasslands. 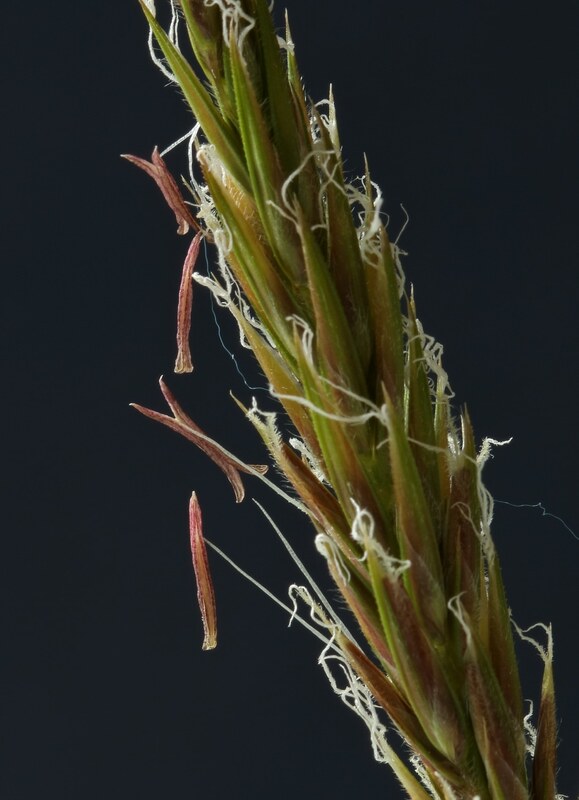 All grasses are wind-pollinated, briefly opening their flowers to expose the hanging anthers and feathery stigmas. These photographs are just after flowering, with the anthers emptied of pollen and the stigmas now tangled together. A close-up of the flowering heads of spreading meadow-grass shows some of the individual structures which characterise the whole family. 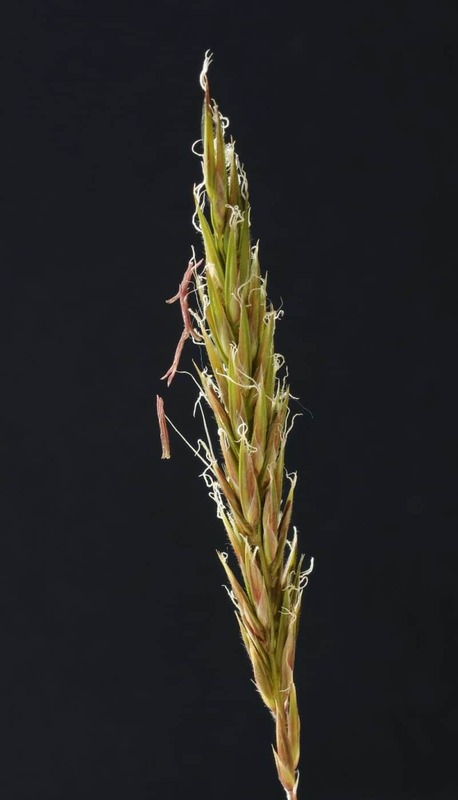 An individual head or spikelet is protected by a pair of tough glumes at its base. 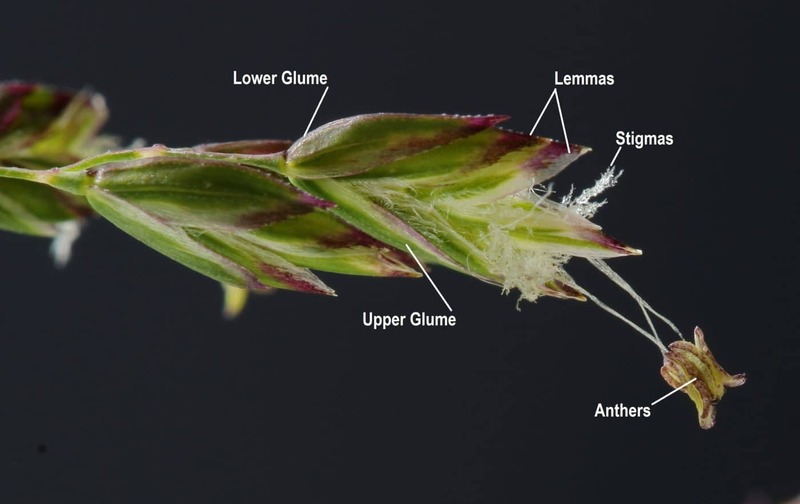 The spikelet contains about five florets, the functional parts of which are in turn protected by tough membranous lemmas; these last may in other species, such as barley, sport long awns which aid the dispersal of the fruits. Some seventy kinds of grasses have been recorded in Assynt, distributed in their habitats of choice from shorelines to the tops of the hills. Eight of these have not been seen in recent years, but two have been discovered since the publication of the Flora of Assynt. Their naming is not always easy, especially in the case of bents and fescues, but it can be mastered with a little application and a collection pressed in an old telephone directory! And if you don’t need to put a name to them, you can still admire their success and the intricacy of their flowers and fruits.